The warm weather makes me crave tart and sweet citrus desserts. 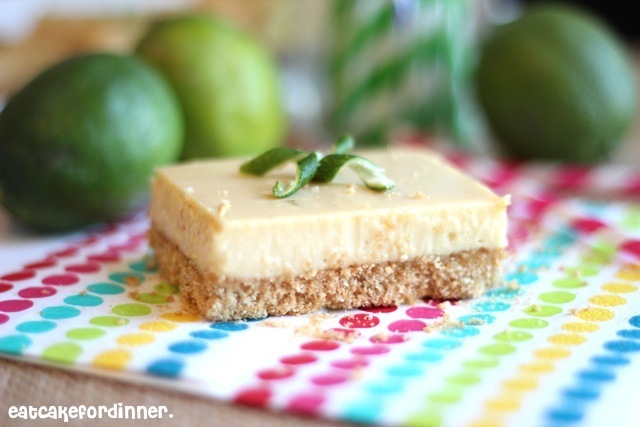 Key lime is one of those citrusy desserts and I needed some ASAP. 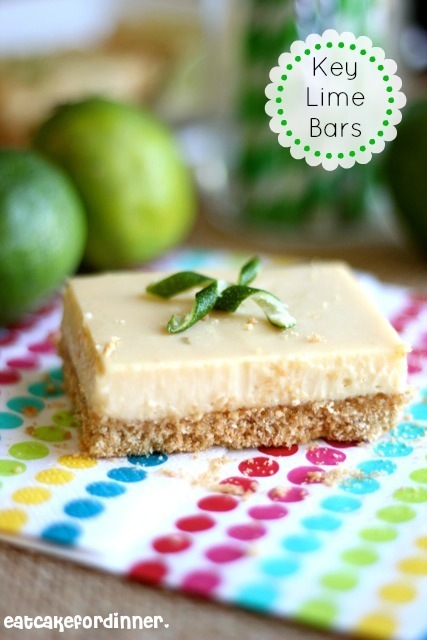 These are the BEST key lime bars I have ever eaten. Cook's Illustrated tested both regular limes and key limes and the taste testers couldn't tell the difference, so for the sake of juicing 4 regular limes vs. 20 key limes, they opted to use regular limes in this recipe. I, myself, opted for bottled key lime juice. I really love that stuff. I like to pour myself a glass of it and drink it on hot days. The crust is phenomenal. The brown sugar gives it a toasted nutty caramely flavor. I thought it would be too much, since it is almost as thick as the filling, but it was perfect. This crust would also be fabulous with a banana cream pie. Preheat oven to 325 degrees. Line an 8x8-inch baking pan with aluminum foil, press into corners and up the sides of the baking dish, leaving an overhang to easily remove bars when done. Spray with cooking spray. For the crust: Add animal crackers, brown sugar and a pinch of salt to a food processor. Process until you have fine crumbs. Drizzle in melted butter and pulse until crumbs are evenly moistened with butter. Press crumbs evenly and firmly into bottom of prepared pan. Bake until golden brown and fragrant, about 18 minutes. Meanwhile, for the filling: Stir together softened cream cheese, a pinch of salt and grated lime zest. Whisk in the sweetened condensed milk. Add the lime juice and whisk until smooth and creamy. Last, whisk in the egg yolk. Pour mixture over warm baked crust and spread out evenly. Return to oven and bake until filling is set and barely beginning to pull away from the sides of the pan, about 17-20 minutes. Let cool on wire rack to room temperature; about 1 1/2 hours. Cover with foil and refrigerate until chilled, at least 2 hours. Remove from pan using the foil overhang; cut into 16 squares and serve. Jenn's Notes: I used bottled Nellie & Joe's Key Lime Juice (found at most grocery stores) instead of fresh lime juice. These bars are the best I have had and I wouldn't change a thing from what I did. These sound amazing and I love that you used animal crackers for the crust! Why haven't I thought of that!?? I have everything in my pantry/fridge for these (right down to the Nellie & Joe's) - we'll be making these tomorrow! Thanks for sharing. Let me know what you think if you end up trying them! I will have to try these and I am still really wanting to make the yummy oreo cookie dessert you posted a while back. I know i would eat it all is the problem, have to wait for some company. I hate for my kids to eat a bunch of junk, I have no self control and I have a weird husband who doesn't really like sweets. Both desserts are super yummy! You really can't go wrong with either! Oh man I do love me some key lime!!! I have used fresh, but my gosh it's such a pane squeezing all those little limes! Thank you for using the bottle! The crust is fantastic! My husband's birthday is this coming Thursday and he loves Key Lime pie and animal crackers so I MUST make this for his birthday. Thank you so much for this recipe. I think it will become a family favorite. 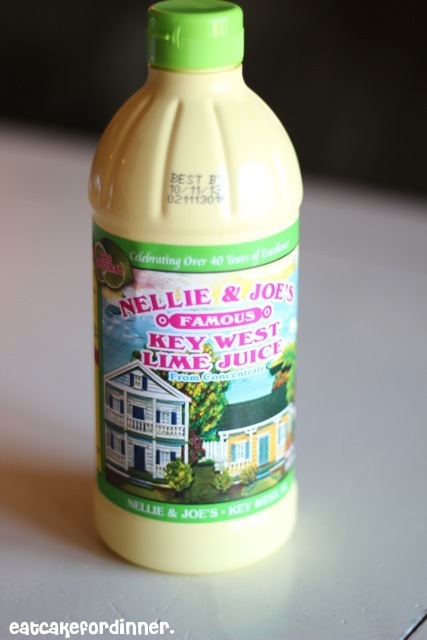 I use the exact same key lime juice!! I hope he likes it as much as I did! Happy Birthday to him! Made these for my dad for Fathers Day and they were fantastic! It was the perfect tartness and the crust was my favorite part! Thank you for the recipe! don't have limes on hand. No more trips to supermarket for 1 item. If you can't find them, you could always use a graham cracker crust. I love the animal craker crust. Thanks for sharing that. gluten free cheerios work great for the crust as well.